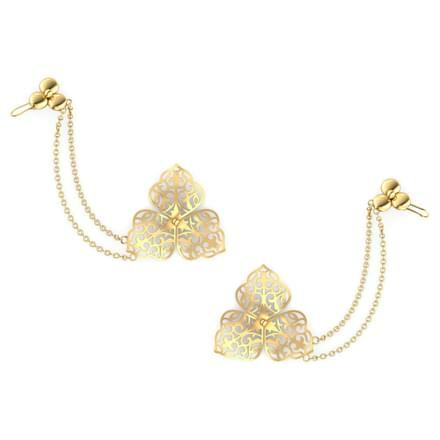 Gold Earrings have been known to steal the hearts of many since time immemorial. So much so that the oldest earrings ever spotted were discovered in Iraq in 2500 BC. But let us just say that earrings were far more than just ornaments in the past. How is that? Let's take a look! Interestingly Sailors in the olden days saw earrings as a sign of their seafaring adventures. In fact, the common folklore tells us that earrings were given to young sailors to commemorate the first crossing of the equator. Or when they managed to find their way around the treacherous waters of Cape Horn. 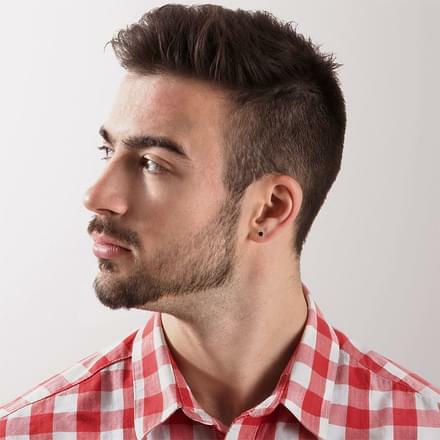 Some sailors believed that earrings improve or even cure bad eyesight. And this is particularly true of silver and gold earrings as they believed that precious metals held magical healing powers. Sailors also wore earrings as a bait for a decent burial. In case they drown in the rough seas and are fond washed on the shores, these earrings would ensure they get the burial they deserve. Now that we have looked at some of the most interesting tales surrounding the earrings in the past, let's jump right back into the present and talk about the gold earrings of now. 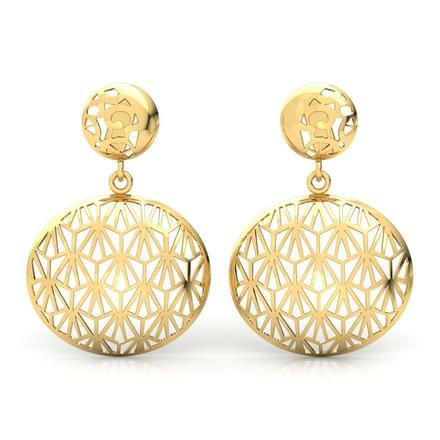 Today gold earrings are used by women and men of all ages and even kids. 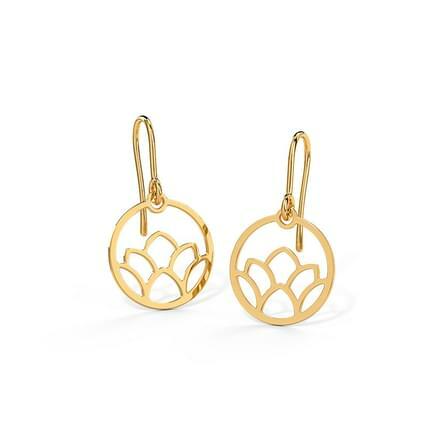 A traditional form of jewellery, gold earrings are a woman's favourite and most worn ornament. 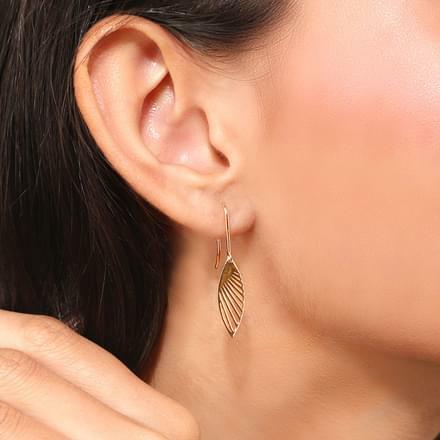 With a massive variety of gold earrings designs available for everyone, CaratLane brings forth a huge variety of it all. 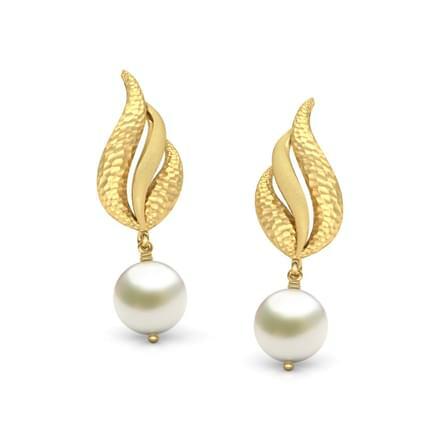 Though, more popular among women, the range of gold earrings designs for daily use available for women is vast. 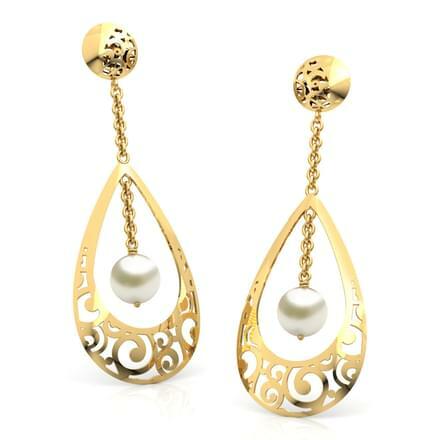 The portal offers a variety of gold earrings designs with price enlisted online. 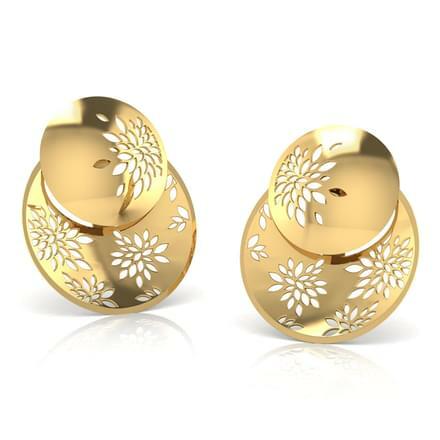 Perfect for office use, studs are the most loved gold earrings for women today. 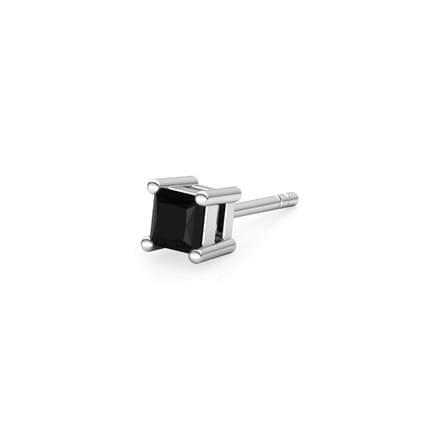 Blending perfectly well with formals and casuals, these studs add just hint of ornamentation making them neither too loud nor too muted. 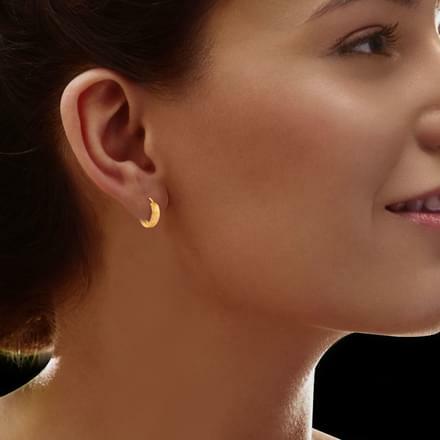 Simple gold earrings are indeed the most sought-after form of jewellery for women. 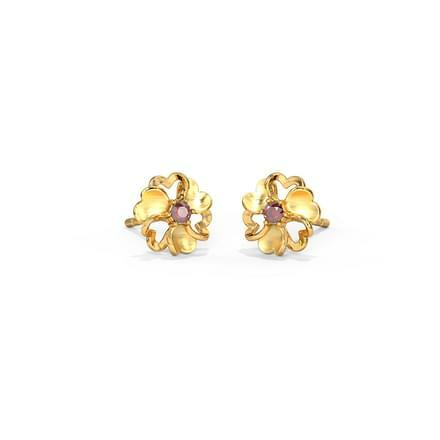 Traditional stud earrings like the gold earrings designs with price and the Eva Swirl Stud Earrings, set in 22 Kt Yellow Gold are classic gold earrings designs for women. 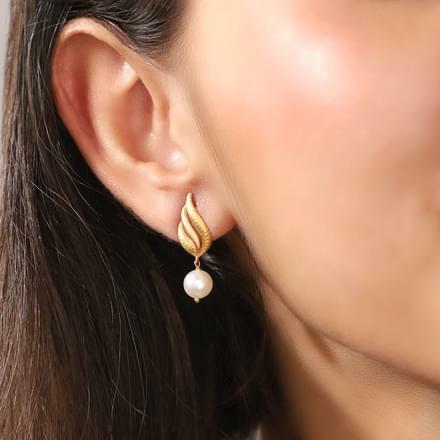 The Symmetric Filigree Stud Earrings from the Enchanted collection, set in 18 Kt Rose Gold or the Crescent Gold Stud Earrings from the Ikat collection, set in 22 Kt Yellow Gold are stylish gold earrings designs for daily use for women. 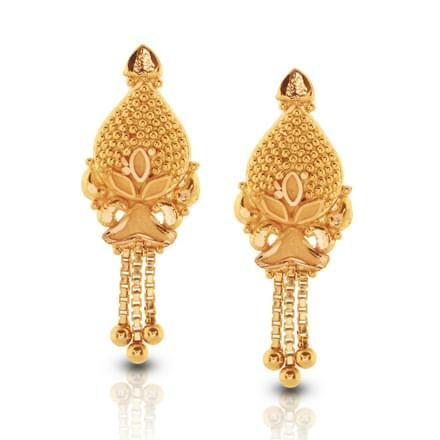 A Gold Jhumka is the most preferred choice of gold earring for women when it comes to pairing with traditional wear. Heavy and detailed, gold jhumkas are a part of every Indian woman's trinket box. 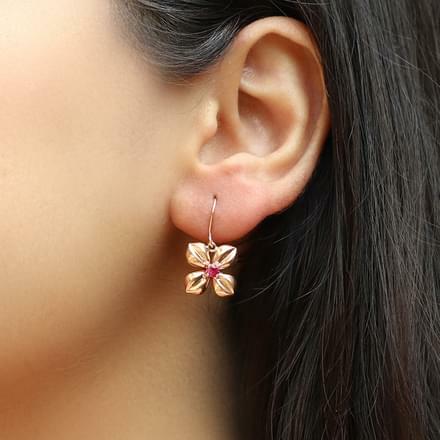 Available in multiple latest gold earrings designs, these look as mesmerizing every time you wear them. 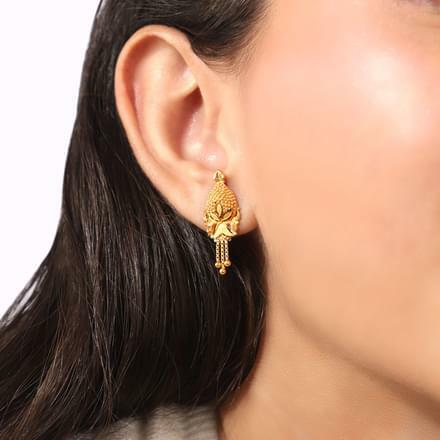 Pick from CaratLane's huge collection of gold jhumkas for women! 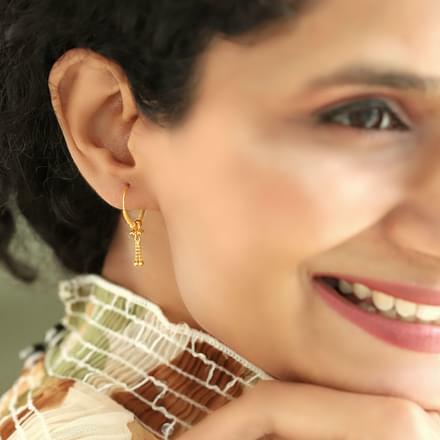 The classic Tania Pearl Drop Jhumkas, set in 22 Kt Yellow Gold are a must-have for every jhumka lover. 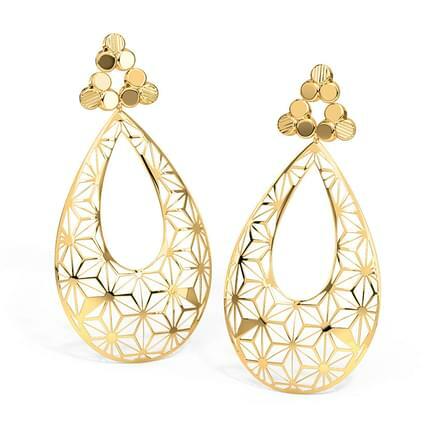 The Oro Corona Drop Earrings, set in 22 Kt Yellow Gold is another stylish yet traditional gold earrings designs. 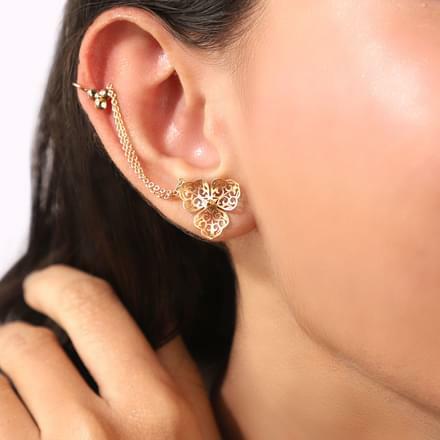 Gold Hoops are the type of earrings that stand right in the middle of studs and jhumkas. Also loved by many, these are perfect for western wear and parties. Light and long, these pairs can be teamed with almost anything that the wearers need to pair them with. Known as a traditional earrings style for women, hoops have now got a modern twist to it and can be seen worn by almost everyone. 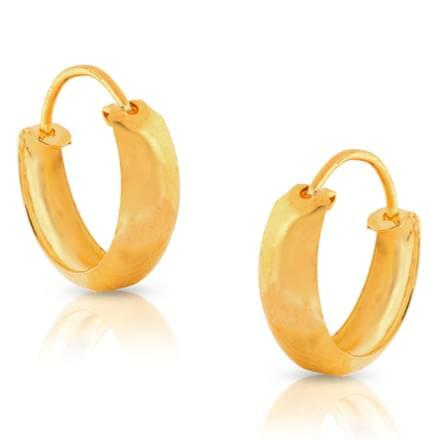 CaratLane offers a magnificent range of gold hoop earrings for women as well as kids, to choose from. 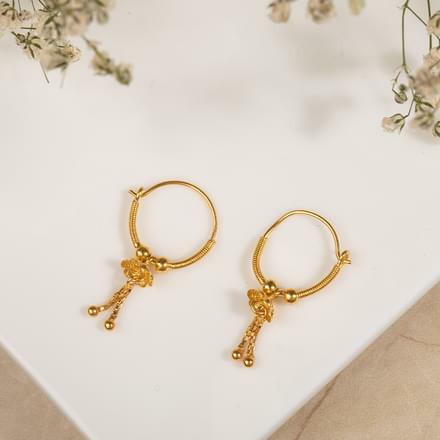 The Rigged Gold Hoop Earrings from the Chokapora collection, set in 22 Kt Yellow Gold is a bold and beautiful design of gold earrings for women. The Fania Beaded Hoop Earrings, set in 22 Kt Yellow Gold is a contemporary take on the classic hoops. Try the intricately designed Ahana Beaded Gold Drop Earrings, set in 22 Kt Yellow Gold for everyday wear as for special occasions. 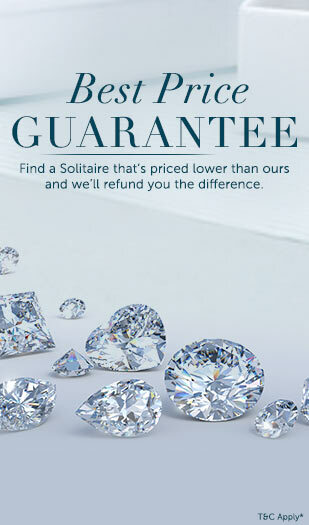 Diamond earrings set in gold have the highest value over all kinds of gold earrings. These are the sign of affluence and give the wearer the feeling of being presentable, no matter the occasion. Be it a salwar suit, a jean with a top or, a sari, these are always occasion-ready. Every evening dress needs an add-on and gold earrings are exactly what we all look out for. 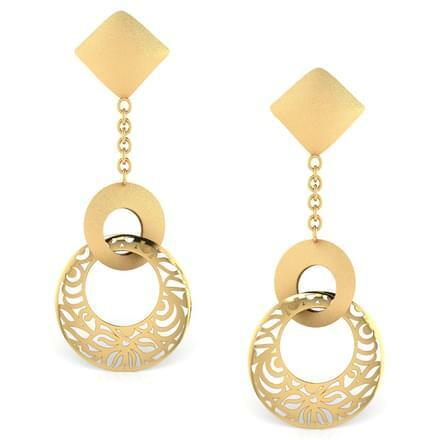 Check out the fashionable collection of evening wear gold earrings designs available on CaratLane. 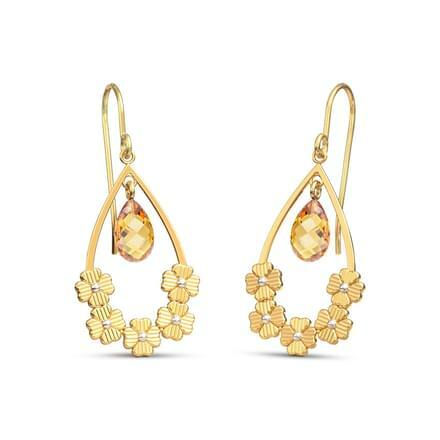 The Marigold Fan Chand Bali, set in 22 Kt Yellow Gold is a never-fail design of gold earrings as evening wear for women. 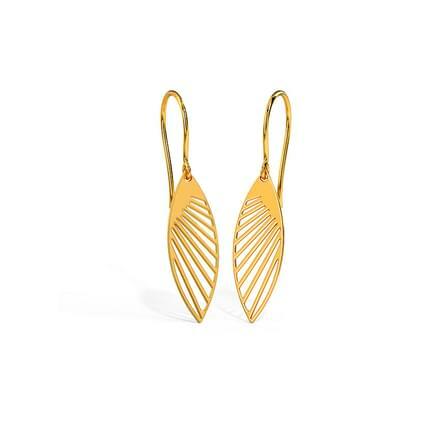 The Antara Lotus Gold Drop Earrings from the Uttarakshin collection by CaratLane, set in 22 Kt Yellow Gold is another chic pattern of gold earrings for women. 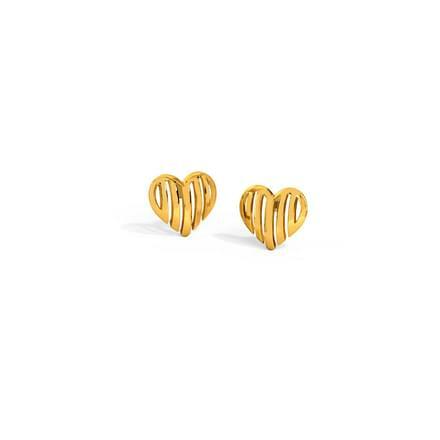 When gift shopping for a woman is on your mind, gold earrings will always be a no-brainer. They are beautiful, can be a great surprise, can be packed in pretty little boxes and can be the best way to show you care. 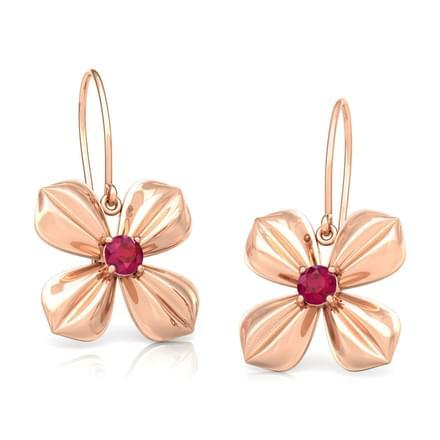 Whether you are looking for gold earrings designs for daily use, long gold earrings or gold diamond earrings, big or small, earrings are close to everyone's heart. 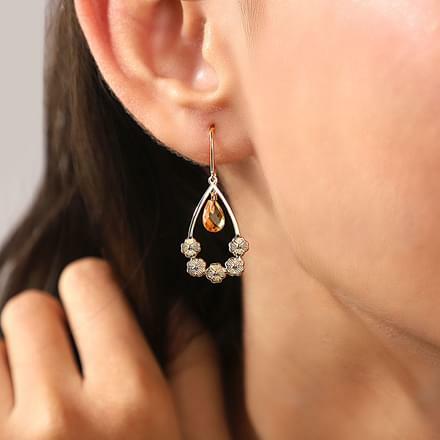 Searching for gold earrings for women, kids or babies, CaratLane is going to be the one-stop-shop for shopping gold earrings online as it offers an extensive gold earrings designs catalogue for everyone. 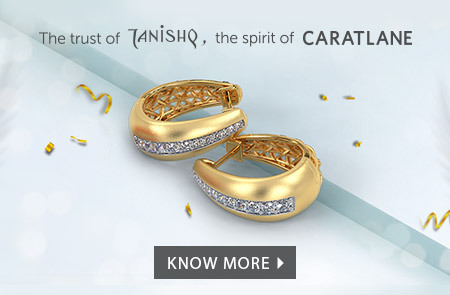 At CaratLane we have numerous real gold jewellery designs with a price range that starts from Rs. 4,593 and goes up to Rs. 2,12,487. Indulge in our extensive range Gold Earrings or visit any of our stores to buy some of the most contemporary gold earring designs available for men and women.